Thoughts of a Closet Recluse: An excitable pup, an uncontrolled mutt, now a respected old dog. An excitable pup, an uncontrolled mutt, now a respected old dog. It’s a clip through mid-wicket, a scream of delight fighting its way over the decibels of 30,000 boisterous Indian fans, and several punches in the air with that glorious royal green cap on his head to compliment a century on debut. It’s the busy rush that hastened a batting collapse and rewarded bowling figures of six wickets for nine runs. It’s the pull through square leg on the last ball before lunch in his first Test in front of home fans at Brisbane. It’s the patrolling of cover point next to Andrew Symonds; the catches, the stops, the run outs, the theatrics, the energy. It’s this boyish youth amongst a dominating army of aging modern cricketing greats, driving fast cars, a diamond ear stud, spiky blonde hair, flash restaurants, thumping nightclubs, the Arabic scripture tattoo, a Slazenger bat sponsorship and the dream girlfriend. Then it was the getting out, the getting dropped, the getting recalled, and the getting dropped again. Then it was becoming a figurehead for everything that Australia supposedly wasn’t. The brash enthusiasm became arrogance, the youthful cheekiness enticed intolerance. Then it was the run-ins with bloke’s blokes like ‘Katto’ (Simon Katich). ‘Haydos’ (Matthew Hayden) thought he was an ungrateful see-you-next-Tuesday and ‘Warnie’ (you know, the guy from the Marshall’s Battery ads?) was no longer his babysitter, grooming into the superstardom lifestyle. Then it was quitting a tour of New Zealand to tend to that dream girlfriend’s insolence of trusting Brendan Fevola with a camera phone in a bathroom setting. Then it was unseating ‘Punter’ (Ricky Ponting) as the captain of the Australian Cricket team at it’s lowest ebbs in two decades, and his announcing as the captain of the Australian cricket team being about as welcome to the Australian public, as a fart in a space suit. An excitable, bubbly, clearly talented cricketer who burst on the scene at 22 into a cricket team with the average age of 32, and embraced the nickname, ‘Pup’. Who knew that a nickname and its evolutions, could so clearly detail one’s man rise, fall, then second rising and imminent final bow? The second rising of Michael John Clarke came from so many low points with glitters of resurgence that were hushed back down by an unrelenting and, at times, unappreciative cricketing public. At one stage, a national newspaper apologised to Clarke on behalf of the public four years ago. But now that Clarke’s end is nigh as at some stage tonight, or in the wee hours of tomorrow morning while Australia sleeps, it’s this same public that is divided on what the outgoing captain of the Australian cricket team could, would or should be remembered for. Let’s go back. It was the start of the career that was so tantalising. Clarke – then known, and probably eternally, as ‘Pup’ – strode out to bat in Bangalore, India, a place where Australians, in the past and the present, have had their Test careers spun into a daze and hung out to dry. Against Zaheer Khan, Anil Kumble and Harbajhan Singh, where his colleagues saw minefields and hand grenades that spun, bounced, stayed low and bamboozled, ‘Pup’ saw runs. 151 of them in fact. On debut if you don’t mind. Australia went on to win the series – the first in India for years and years. The year was 2004. We’ve never won there since, and look about as likely Bronwyn Bishop accepting a gift voucher for helicopter ride this coming Christmas. Then he came home to Brisbane, took the New Zealanders to task to become the first batsman in history to score a Test century on both overseas and home soil debuts. Michael Clarke could bowl, bat, field, smile, and jag Lara Bingle. As an 11-year-old, I thought he could lecture on the subject of Life 101. He was young. He was the prototype for young cricketers. The cricket apparel company Slazenger picked him up and brought out Michael Clarke bats. I wanted to bat like ‘Pup’, bowl left arm off-breaks like ‘Pup’, field like ‘Pup’ and tie down a fit bird like ‘Pup’. The point is this: Michael Clarke was the idol for young cricketers, with confidence and talent to boot. But as is the way society can be puppeteer-ed by the media’s influence as we consume the printing press’ content like a 4am McDonalds quarter pounder, Clarke fell out of form and favour. The losing of wickets just before a break, the hitting the ball in the air to fielders, heightened the criticisms to the point that we felt like when ‘Pup’ made dig-deep centuries, the cricketing public felt that was the least they were owed. As the aged champions ‘Pup’ started his career playing under retired, ventured into the media and discovered a thing called ‘hindsight’, things continued to unravel while Clarke took the leadership reign. Then with the Australian public’s hatred, no bat sponsor and an experienced, touring Indian side wanting to rub salt into the wound staring him in the face, Clarke let his sticker-less bat do the talking. A triple century, two double centuries and another hundred just for good measure. A 4-0 home whitewash. The Sydney Morning Herald’s apology. The wheel was starting to turn, before a trip back to India jammed the revolution and sent proceedings the other way. Big series losses in India and South Africa, a third Ashes campaign loss in England (out of four, and his first of two as captain) and it was back to square one. A return home ashes series had everyone ironically predicting a 5-0 whitewash in favour of the touring Poms, after consecutive series defeats, including a home series 3-1 loss for the first time in three decades back in 2010-11. A summer later, Australia played England 13 times across the Test, One-Day and Twenty20 formats, for a result of 12 wins and one loss. Clarke had the respect back. But for all these trials, tribulations and periodic celebrations, nothing came close to the tragedy of Phillip Hughes. 10 years had passed since the ‘Pup’ had made a debut in India. He’d outgrown the nickname to be known as ‘Clarkey’ and was starting to outgrow his personality of being a ‘mutt’ in the eyes of everyone outside of the cricket team he was leading. While Victorians submitted votes for their next premier, cars slowed, televisions were turned right up and people stood to listen, watch and take in Michael Clarke at his most vulnerable. This pup and one-time mutt, was now an old dog, with sad, old eyes and breaking voice for someone who had long barked with confidence. The press conference and eulogy was the mark of a man representing his own heartache, Hughes’ family’s despair and Australia’s hollow anguish at losing a man so young to an incident so cruelly infrequent. 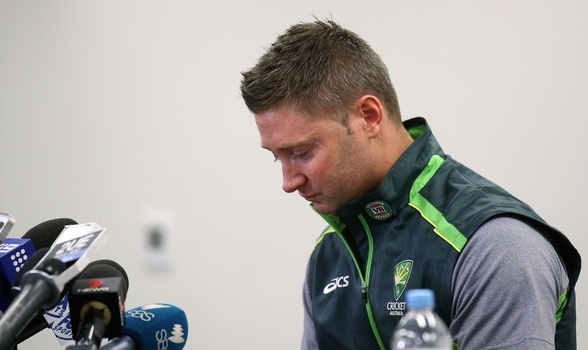 Unlike Tony Abbott, when a leader was required for a nation in grievance, Michael Clarke stood up. It was hard, it was tear-jerking, it was moving, but it was done. Just as impressive was the hundred made after retiring hurt to a troublesome back with a broken heart and severely limited technique. It was classic Clarke in strength of character, but not by any means vintage Clarke in aesthetic. Captain-in-waiting Smith made a century with Clarke and celebrated calmly, creating everlasting of raising his bat to the sky while standing on the grass-painted 408 – Hughes’ test number – on the Adelaide Oval. Clarke could barely walk through the two runs that took him past three figures, but his face as he accepted the applause of the Adelaide crowd spoke volumes. His greater reward would be lofting the 2015 Cricket World Cup in his own backyard; all the while his own countrymen continued to vulture his and his teammates’ shortcomings. Captains of sports teams will be forever remembered by their legacy they left behind. For all the shortcomings that Clarke may have had playing beneath former teammates, the teammates he led well have the enduring memory of Clarke as the leader when all around collapsed. To think any less is to fall in line with society’s view that our judgement of people can be subjective to individual wants and needs, plus Australia’s tall-poppy syndrome and eager search for the negative. Tonight, Australia will officially hand over the Ashes; Michael Clarke will hand in the captaincy, put down his Baggy Green and take off the black armband embroidered with the initials PH for the last time. In the narrow view of things, Clarke will bow out on a winning note. In the bigger picture, Clarke will bow out as a battler who fought every battle, on-field and off-field, in the search to be ‘great’ and the best he could possibly be. To scale levels of ‘greatness’, and where the young 'Pup', turned battle-hardened old dog, sits will divide pub talk, couches and the Channel 9 cricket commentary team. From the young kid that once wanted to be you, Michael: congratulations on what you wanted to achieve, sorry for what we thought you should have achieved, and thank you for what you did achieve.